Talking about Bronze Valley and its potential impact on the future of Birmingham and Alabama, Herschell Hamilton speaks from experience gleaned during a distinguished professional career. He also draws on strong familial connections to Birmingham’s history as a place of transformative change. His father, Herschell Lee Hamilton, M.D., was active in the Civil Rights Movement, supporting it strategically and financially. He was personal physician to numerous civil rights foot soldiers and Rev. Fred Shuttlesworth, the leader of the Movement in Birmingham. Consequently, the younger Hamilton has a deep-rooted determination to help foster the next impactful era in the city — one of inclusion, growth and development. Hamilton is the Chief Strategic Officer of BLOC Global Group. With offices in Birmingham and Washington, D.C., the company manages, develops and invests in complex, transformative real estate projects. BLOC also provides professional services to electric utility companies that are deploying Smart Grid and Smart City Infrastructure projects. Guiding the strategic direction and impact of BLOC, Hamilton structures business and project opportunities and manages the company’s engagement with clients. Under his leadership, BLOC has played major roles in aviation, master development and mixed-use and mixed-income multi-family developments. Hamilton began his career in investment banking, honing his skills with a concentration on structuring public finance transactions, as well as advising on investment programs for both individual and institutional investors. He served in two high-level public-sector appointments in state and local government, working in the administrations of Alabama Gov. Jim Folsom Jr., and Birmingham Mayor Richard Arrington Jr. In the years just prior to co-founding the firm that became BLOC in 2003, Hamilton co-founded and served as chief operating officer for an internet-based new media company and was vice president of new market ventures for the private equity firm MRG. He earned a B.S. from Howard University and a Master’s in Public and Private Management from Birmingham Southern College. With his wife, Majella, and a host of community members, Hamilton founded The Ballard House Project, a nonprofit cultural center dedicated to promoting dialogue, understanding and greater community connection to Birmingham’s rich African-American history. The project is housed in the city’s Civil Rights District, in a home built in 1940 by Dr. Edward Ballard, one of the first black physicians to practice in Birmingham. The house was later purchased by the Hamilton family as the office for Dr. Hamilton’s medical practice. The elder Hamilton also hosted civil rights strategy meetings there and treated many of those injured during the climactic demonstrations in the spring of 1963, which took place blocks away from the building. Today, the breadth and depth of Hamilton’s experience in the worlds of finance, government, urban real estate development and civic engagement give him a unique perspective on opportunities and challenges relative to economic growth, particularly those that continue to impact people of color. He has seen tremendous change in the economic and cultural landscape of Birmingham and Alabama. 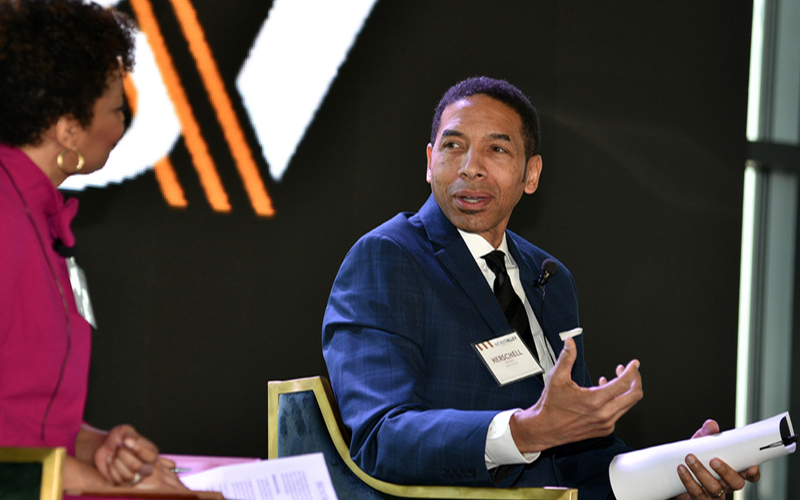 As one who has helped usher in those changes, Hamilton remains dedicated to expanding and accelerating the range of opportunities available to people of color in technology-related fields, whether as entrepreneurs, investors or members of the workforce. “When I started in business here, I looked for mentors who look like me,” Hamilton recalls. “At the time, there weren’t a lot of those around. Continuing to change that is tied directly to taking advantage of emerging opportunities in technology. Across the country and around the world, we’re seeing a massive trend toward re-urbanization. Technology is a critical part of that equation, and I believe Birmingham has an opportunity to be at the forefront of change.